Here’s presentation my publisher and I did for Nate Kievman of Linked Strategies. The webinar starts with Felice Gerwitz of Media Angels explaining Five Secrets Every Author Should Know Before You Write the First Word. My portion on 5 Secrets to Short Cut Your Record Keeping for Tax Benefits starts at about 17:30 if you want to jump ahead. 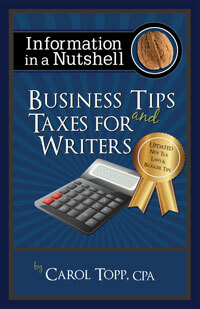 For more tips on cutting your taxes, order a copy of the book Business Tips and Taxes for Writers.